Four Generations of Boating Knowledge and Fun! White’s Marina has been a family owned business in Norway, Maine for Four Generations. We specialize in boat sales, boat service and boat storage. Our goal is to make your boating experiences relaxing, fun and exciting with a main focus on customer service. We want you and your family to be our customer for generations to come! White’s Marina is one of the first dealers of Starcraft Boats and Mercury Outboard Motors which are still a part of our product list today! Our boat dealership is located within an hours drive of Portland or Augusta and within 30 minutes of Auburn, Lewiston, Sebago Lake Area and Naples, Maine. 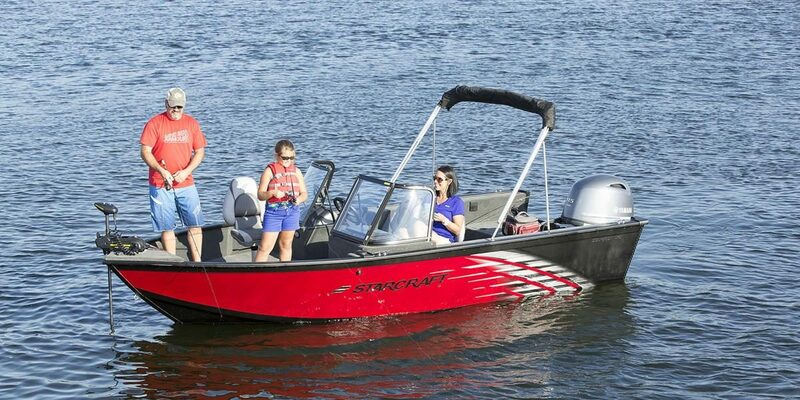 The brands we carry are world class manufacturers of boats and boat motors; Glastron, Starcraft and Starweld Boats, Mercury Outboard Motors, Mercruiser Engines and Venture Boat Trailers. Here at White’s Marina we are committed to giving you the best boat buying experience possible when it comes to acquiring a new or used boat, boat trailer, outboard, stern drive or inboard motor. We can also help you with the financing of your boat as we have partnered for many years with Norway Savings Bank to get you the best rates on your boat investment. Our Marina store has the boat accessories you’ll need to make your new boat purchase the best it can be! Some brands we carry are Humminbird, HO Watersports, Hyperlite, Sportstuff and many more. We also partner with Great Northern Docks to get you a great quality dock to compliment your boat. Our boat service department is also highly regarded with top notch mechanics who are Mercury Factory Certified. The goal of the service department is to make sure you have the best answers to your issues and get you back on the water as quickly as possible. Ask us about our storage, as we handle over 200 boats in our storage facilities from November until May. Some of our customer’s have stored with us for over 50 years. We would love to have you as a customer also. Thank you for choosing The White’s Marina Family for all of your boating and marine needs.